Adults, children, and infants are all included during the instruction of this class. This class is designed for individuals who need a CPR card for either personal fulfillment or for work purposes in industries NOT involved with medicine/healthcare. It is best to ask your employer which class is required for your employment. This class is perfect for the lay person, the fitness instructor, the educator, or the childcare professional. This class is also appropriate for parents or couples ready to adopt, expectant parents, or anyone else who does not work in a any kind of medical/healthcare industry. Please note: If you work in any kind of healthcare or medical field, or are a student of, or plan to be, this is most likely NOT the appropriate class for you. You should consider taking the BLS for Healthcare Providers class. 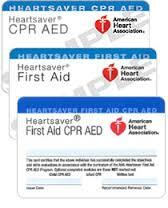 Click here for a description of the BLS class and where you can register for BLS classes. It is best to contact your employer or education institution to inquire about which class you need. 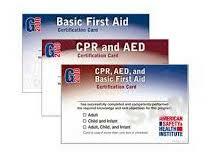 First Aid instruction includes stopping bleeding, wounds, choking, shock, seizure, fainting, Epi-Pen, and more. All modules: 7½ hours approx. First Aid only: 3½ hours approx. * It is the students responsibility to register for the correct class they need for work, school, or other obligation. It is suggested you contact your employere or educational institution for clarification.